Last summer, when Darren and I renovated our new home, we were especially focused on the kitchen re-design for one reason: a self-produced online cooking show. It’s been in the plans for years now, and we are very close to finally shooting our first episode. Excited!!! Of course, the show will feature easy plant-based recipes. I’ve had so much fun sharing recipes on Snapchat, that I want to create videos that don’t disappear! They will be easily accessible online anytime. Expect lots of classics to start: almond milk (done multiple ways), vegan pavlova, tofu scramble, cauliflower buffalo wings etc. 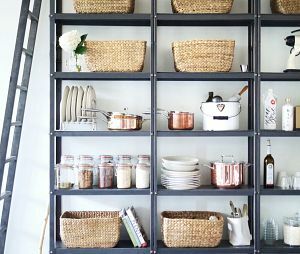 Back to the kitchen design: our new exposed shelving (pictured below) was key in order to display and easily access kitchen treasures and beautiful ingredients. A cooking show set needs to be pretty! But once I started arranging my things on the shelves, I realized not all of them were adding much aesthetically. My old pot set, for example, was more functional than stylish. 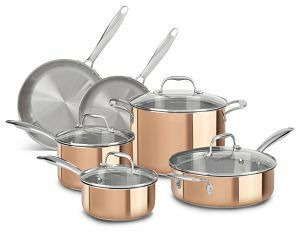 I stumbled across KitchenAid’s Tri-Ply Copper 10-piece Set online and noted its beautiful copper colour and affordability (compared to many similar sets on the market). They’ve since become one of the focal points on our shelves. They’re also perfect for using in the cooking show itself! 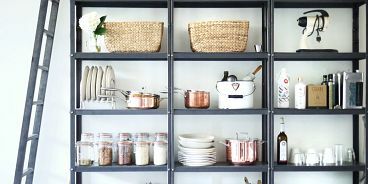 Read my full post about the copper pots here and check them out on KitchenAid’s site here. 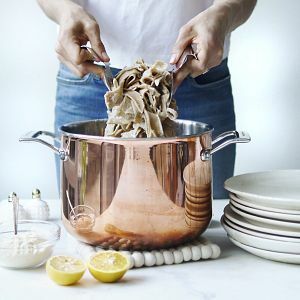 Below is the biggest pot from the set, and it’s perfect for making soups or big batches of pasta. If you’re looking for the best vegan mac & cheese recipe out, try this one (pictured below)!!! It’s my very favourite. Thanks to KitchenAid for sponsoring this post – all opinions are my own.